It’s been about 3 years since we last heard from Canadian thrash band Mortillery. “Shapeshifter”, which comes out at the end of May on Napalm Records, is another excellent continuation of the band’s sound. As with the previous record, one of the biggest draws to Mortillery is lead singer Cara McCutchen. Her voice is one of the rare few in thrash that can easily straddle the line between impressive virtuosity, and throat-ripping screams. She tends to lean more towards the aggressive side of things, but every once in a while, there’s a major indication that she’s much more technically skilled than the average thrash vocalist. The above description is also consistent with the music: Mortillery delivers hard-hitting thrash quite often, but they’re willing to get more melodic at times to keep things interesting (the opening to “Age of Stone” being one great example). The band also isn’t afraid to incorporate some punkier thrash riffs into their sound. They have a unique sound in that the playing is extremely tight, but it also feels like it’s about to fly off the hook at any second. Calling “Shapeshifter” a wild album isn’t quite strong enough to get the feeling across that Mortillery presents. The constant screaming, combined with solos that erupt from seemingly nowhere result in a very out of control record (in a good way). The band tends to keep the tempos high, avoiding a feeling of sluggishness. Even when things occasionally get a bit more mid-paced, the music still feels energetic and exciting. 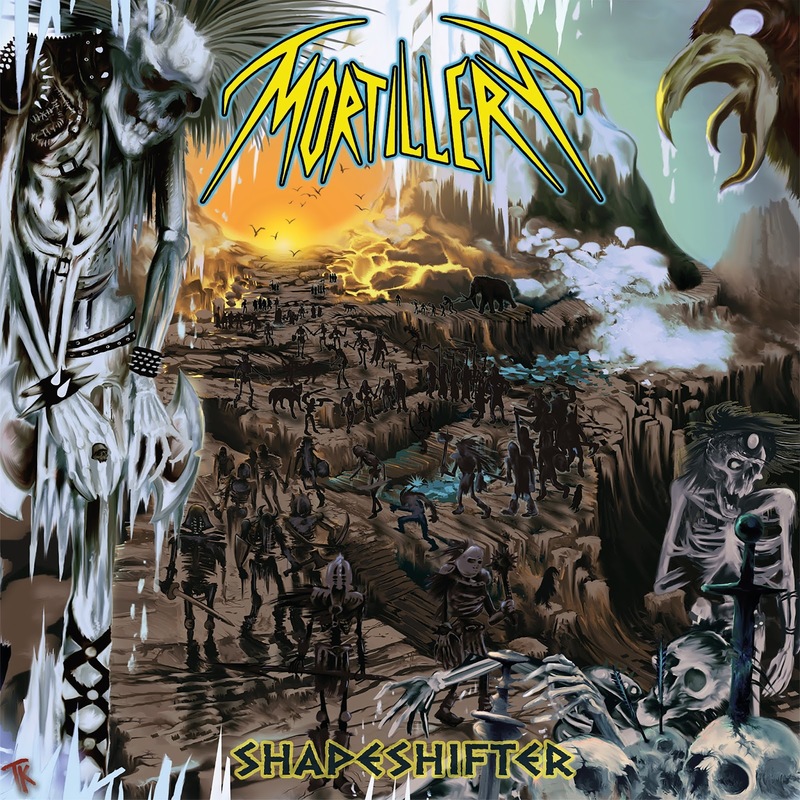 As much as Mortillery does everything right on “Shapeshifter”, the songwriting didn’t quite grab me the way it did on the last record. There are a lot of good moments here, but the hooks don’t feel as distinctive or as memorable. Typically, this would be the kiss of death for a thrash band, but Mortillery is such a unique entity in thrash that this album is enjoyable even if you can’t remember how every song goes. Fortunately, the production further enhances the quality of this record, as every instrument is about clear as it could possibly be, without sounding sterile and overproduced. From an execution standpoint, it’s impossible to criticize “Shapeshifter”. Everything on this record works well, and though the songwriting may feel a tad bit weaker than in the past, it doesn’t mean that you should skip this album. In fact, it’s a refreshing change of pace from a lot of other thrash out right now, and for that reason, it is an essential purchase.